Farfetchd in game: 6,111 Who? Important notice! Pokemon Farfetchd is a fictional character of humans. Farfetch'd made its first appearance in So Near, Yet So Farfetch'd under the ownership of Keith. In A Way Off Day Off, Farfetch'd lived on a deserted island which is the home of many different fruit trees. 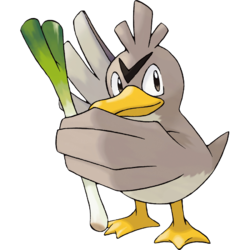 A Farfetch'd appeared in A Farfetch'd Tale under the ownership of Sylvester, a Trainer who was trying to learn to make Charcoal by using Farfetch'd's Cut attack. In Putting the Air Back in Aerodactyl!, multiple Farfetch'd appear when Crystal whistles. In Smells Like Team Spirit!, a Farfetch'd was used by Brock's battle partner Holly against Ash and Paul during the Hearthome City Tag Battle Competition. Wilkinson used a Farfetch'd in the Pokémon Ping Pong Tournament in To Thine Own Pokémon Be True!. A Farfetch'd was one of the Pokémon seen at the Pokémon Swap Meet in Tricks of the Trade. A Farfetch'd appeared Lucario and the Mystery of Mew, A Rivalry to Gible On!, A Blustery Santalune Gym Battle!, A Jolting Switcheroo!, Heroes - Friends and Faux Alike!, Diancie and the Cocoon of Destruction, and Dreaming a Performer's Dream!. 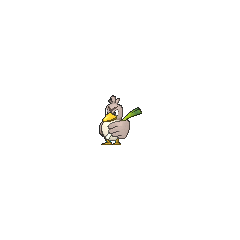 A Coordinator's Farfetch'd appeared in Weekend Warrior competing in the Silver Town Pokémon Contest. A Trainer's Farfetch'd appeared in A Battle by Any Other Name! participating in the Poké Puff Contest. XY050 Farfetch'd Serena's Pokédex Farfetch'd, the Wild Duck Pokémon. Farfetch'd uses the stalk it holds as a weapon. Wielding it like a sword to cut a variety of objects. Farfetch'd debuted in Just a Spearow Carrier at the Indigo Plateau with its trainer. A wild Farfetch'd appeared in Extricated from Exeggutor where it was saved by Yellow after getting attacked by a group of Exeggutor while it was trying to find its nest. Afterwards Yellow helped it try to find its nest and later helped Yellow escape the Exeggutor and Oddish. Later it had finally found its nest with the help of Yellow and later said its goodbye to Yellow and Pika. Farfetch'd is the Pokémon owned by an Azalean boy first seen in You Ain't Nothin' but a Houndour. Both the boy and Farfetch'd fell victim to the onslaught of the Masked Man's Pokémon in the depths of Ilex Forest. 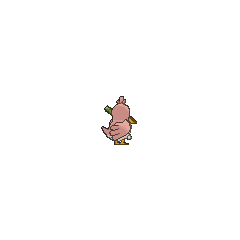 Bill is later seen in A Flaaffy Kerfuffle riding a Farfetch'd as a mode of transport to pass Crystal the Portable Pokémon Transporter. It later helped Bill escape from Staryu, but got trapped with him but were later rescued by Crystal in Surrounded by Staryu. A Farfetch'd appeared in The Last Battle XIII as one of the Pokémon sent to help the fight in Ilex Forest. A Farfetch'd was used by Emerald during his Factory challenge in Pinsir Me, I Must Be Dreaming. A Farfetch'd appeared in Skirting Around Surskit I as a rental Pokémon that Guile Hideout stole. Pokémon Super Mystery Dungeon: Farfetch'd is the teacher of the hero and partner at the Serene Village school. He is a serious teacher, but lessons are often interrupted. 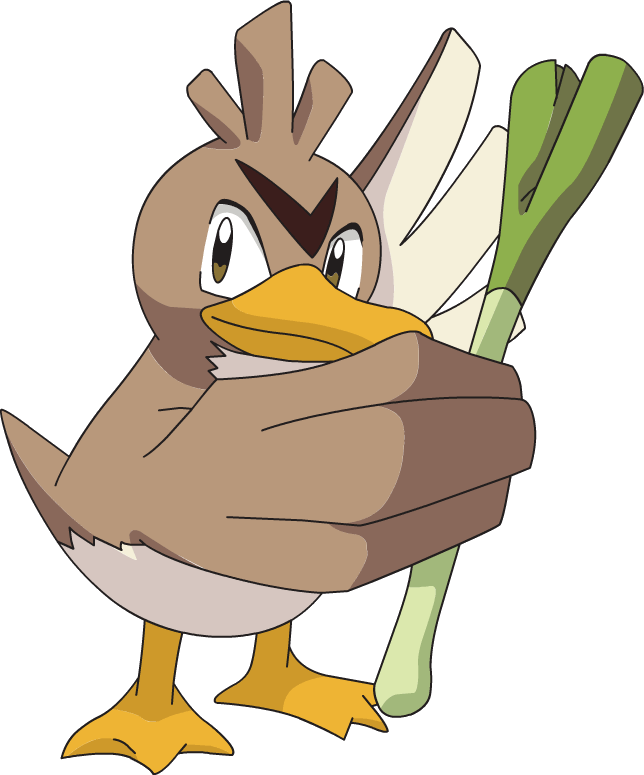 Farfetch'd may be inspired by the Japanese saying 「鴨が葱を背負って来る」, literally translating to "a duck comes bearing green onions". As a saying, it means "something surprising but convenient". The phrase can be shortened simply to 「鴨葱」.